Thanksgiving for us tends to be a pretty laid-back affair. It’s just the two of us, so we don’t stand on the traditional mid-afternoon meal time (the point of which I have never exactly understood, anyway). For the past few years, I’ve spent Wednesday evenings baking desserts and Thursday mornings prepping for dinner; I make soup with some fresh bread for lunch, and start working on our rather small turkey after that, so we eat Thanksgiving dinner at dinnertime. This year’s menu was a bit modified because of Jeremy’s flu earlier in the week. He hadn’t eaten a full meal since probably Sunday, so I was afraid he wouldn’t want much for Thanksgiving either. But as it turns out, he did a pretty good job of cleaning his plate, even if he didn’t feel up to being my sous chef this year. We got a little 8lb free-range turkey from Whole Foods, and I soaked it overnight on Wednesday in a cider brine from this recipe, cut in half for the size of our turkey and the amount of cider we bought. 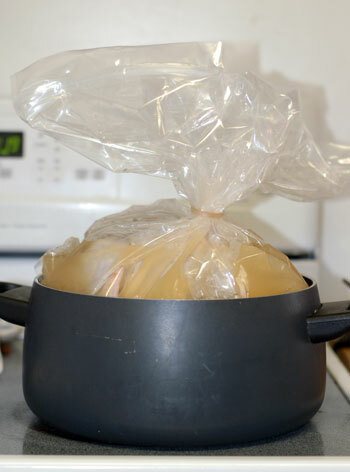 I bought a turkey brining kit at the store that was supposed to contain a bag and a brining solution, but the only thing in the box was the enormous bag, so I had to improvise. As you can see from the photo above, I ended up rigging the bag with twist ties at the top and both bottom corners, to reduce the space inside. That, plus shoving the turkey, brine and all, into a smallish soup pot, raised the level of the liquid to the top of the turkey, and it spent the night and the following morning in that constrained condition. Yesterday afternoon, I got Jeremy’s assistance draining and rinsing and thoroughly drying the turkey. The recipe I chose this year, Roast Turkey with Cider Sage Gravy from Epicurious, called for pretty minimal prep: butter under the skin and brushed on top, salt and pepper, clove-stuck onion inside. 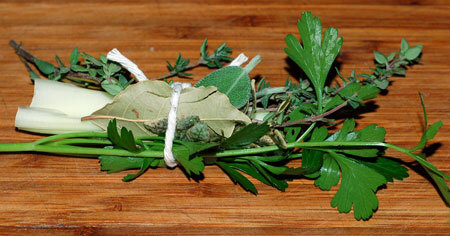 I did get to make my very first bouquet garni, partially with herbs from my own little bed out back, so that was fun. I roast my turkeys with a foil cap over the breast meat, that I take off partway through cooking. I probably should have covered the legs a little this time as well, but the turkey still came out just fine. It came out of the oven to rest, and I made the cider gravy using fresh turkey stock: While doing initial prep for some of my sides in the morning, I saved all the veggie trimmings and sauteed them with the turkey’s neck and giblets, along with some whole carrots, smashed garlic, chunks of onion, and fresh herbs. Then I covered them in water and kept the whole mess simmering on the stovetop most of the day. I ended up with about 8 cups of flavorful brown stock after straining out the dross, and have quite a bit leftover even after making gravy. I should note that this gravy thickened up for me faster than it ever has, and I think it must have been because of the instruction to mix the flour with turkey fat before whisking it into the gravy base. 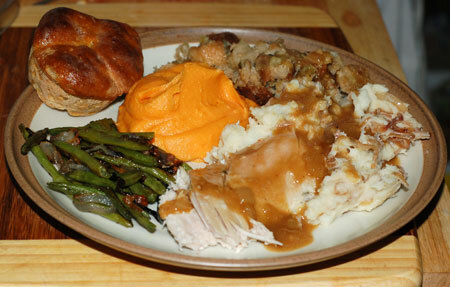 I ended up with a few stray lumps, but it was still the most fool-proof gravy I’ve ever made. As for the rest of the meal, I’ll just point the way to the recipes I used, and a quick mention of how they came out. A few items are worthy of their own posts, so watch for those in the next few days. I always make Slow Cooker Stuffing for Thanksgiving these days because it frees up my time and oven space. 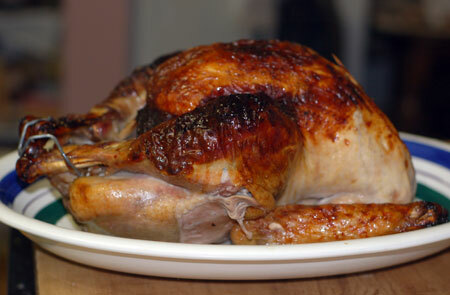 We never cook stuffing in the bird because it makes the whole thing take longer, and there’s the risk of undercooking. It also makes the stuffing too gooey for my taste, and I can think of at least one occasion when we were first married where we forgot to remove the stuffing from the bird altogether. (That would be sacrilege for some, I know!) This year I used roasted garlic bread from Costco as the base of the stuffing, cubed and air-dried overnight and fully dried in a very low oven (about 180F) in the morning. I was planning to try adding chestnuts this year, but I was chatting on the phone with my mother and aunt while making it, and didn’t recall the chestnuts until much later in the day. We’ve always been pleased with how this stuffing recipe tastes. For me, it doesn’t need more than about 2 cups of broth to moisten it, but make sure to check on it periodically through the day, and stir it up to keep it from getting too browned on the bottom. I made Caramelized Shallot and Sage Mashed Potatoes this year, and they were pretty tasty, but I would probably like it better with my shallots diced than thinly sliced as called for. It’s just a textural thing, but all those little shallot rings made my potatoes appear to be kind of stringy. I made the shallots in advance, so when the potatoes were ready, I could just mix it all together. Another side dish that has become tradition around here is that Vanilla Sweet Potato Puree I’ve written about before. Heidi, I think my husband will be forever grateful to you for sharing that recipe. I always end up having to double the recipe because when I ask Jeremy to pick out a pound and a half or so of yams, he puts 4 pounds of yams in the cart. More recipes for sweet potato puree leftovers are no doubt in the offing. When we went to the grocery store last weekend, I filled up a bag of green beans, put it in the cart, and asked Jeremy if he wanted Brussels sprouts for Thanksgiving also. His response was that he wanted only Brussels sprouts and no beans, but it was already too late at that point. I used some of the green beans in my chicken noodle soup earlier in the week, and had planned to roast the sprouts with apples and bacon for the big meal, but with Jeremy sick, I fell back on a less fussy recipe. The green beans weren’t going to last and the sprouts will, so I made Roasted String Beans with Shallots on the understanding that Jeremy wasn’t going to eat any, and will make a pasta dish with the sprouts when we can’t stand the sight of Thanksgiving leftovers for another moment. The desserts, I think, are worthy of their own posts. Per Jeremy’s (more general) requests, I made a paradise pumpkin pie with fresh pumpkin puree, and a cinnamon apple crumb pie. We only tried out the apple last night, but it was fantastic, and will be detailed tomorrow, once we’ve sampled it again (ahem).